The Good: I volunteered earlier this week to do a “Parade of Homes” this morning for the local Builders Association, taking tickets, welcoming people to one of the houses on the tour, for a 4-hour stint. I and another of my coworkers were paired together, and we had fun, chatting with the folks that showed up, even though it was cold, sitting at a table in the house’s open garage (a brisk 46 degrees, with a nice breeze dancing in from one corner occasionally, thanks!). We had a pretty steady stream of people from the opening time of 10, and were supposed to be relieved by our replacement at 1pm. The Bad: Our replacement never showed. About 1:45, we finally got ahold of the organizer of the volunteers, & let her know that we couldn’t stay anymore (my coworker had a child that wasn’t feeling well, & I had other plans as well for my afternoon) , & she was very gracious & thankful that we’d even stayed that long. So, we packed it in, & left. When I got home, I started working on my kitchen again. I’m preparing to re-paint, & need to scrub walls, so went & bought a cheap sponge mop at the dollar store, along with a degreaser spray for the walls. Then, I decided it was time to clean my ferret, Vinnie’s cage, & give him a bath. Bath given, I turned him loose on the floor, & started cleaning his cage. He usually runs around like a Tasmanian devil possessed after a bath while I clean his cage. The Guilt: While replacing the newspapers at the bottom of his cage, after scrubbing, I heard a strange noise in the kitchen. It sounded like he’d gotten stuck somewhere, & was scrabbling, trying to get out. He was by the cat’s water bucket. And his back legs were not working. His back feet were twitching, like he was trying to make them work…but he couldn’t get his hindquarters up off the floor to work like normal. And I hadn’t noticed when it set him on the floor in the towel. He was fine just yesterday, what happened?!? How could I not notice there was something wrong? Did he fall somewhere in his cage? He hasn’t been out of his cage for the last couple of days, and it’s a large, 3-level cage that stands 6 feet tall. He could’ve gotten stuck in the wire-works, somewhere…. 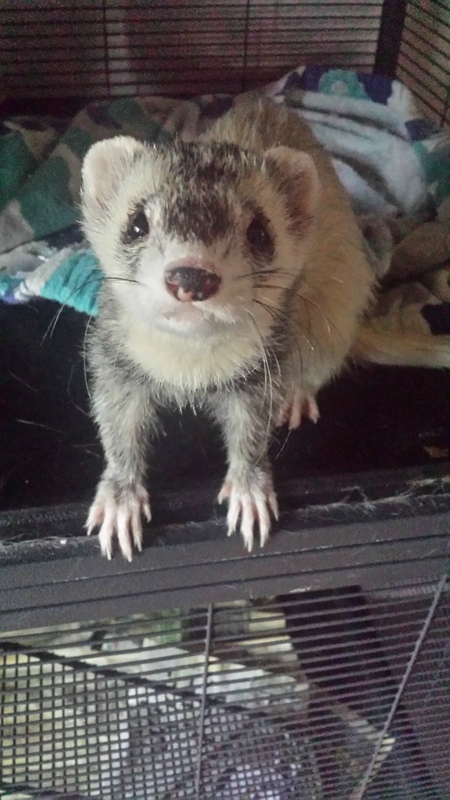 Ferrets are relatively quiet animals, not making much noise, Vinnie quieter than most, he hardly even chatters when he’s excited. But, how did I not notice this?? I feel horrible, guilty, and sad. I know, that if there’s no visible improvement by the beginning of the week, that I’ll have to take him to the vet. I’m pretty positive that there won’t be improvement. Things like this usually don’t work that way. You can figure out the logical conclusion. And that makes this guilt even worse. This entry was posted in anxiety, depression, family, Grief, Life, pictures, random, Randomness and tagged animals, depression, guilt. Bookmark the permalink.